Hello – I am writing to you on behalf of my wife. We have been married almost 22 years and I first heard her story 21 or so years ago. She doesn’t talk about it much but recent events have brought her story back up. 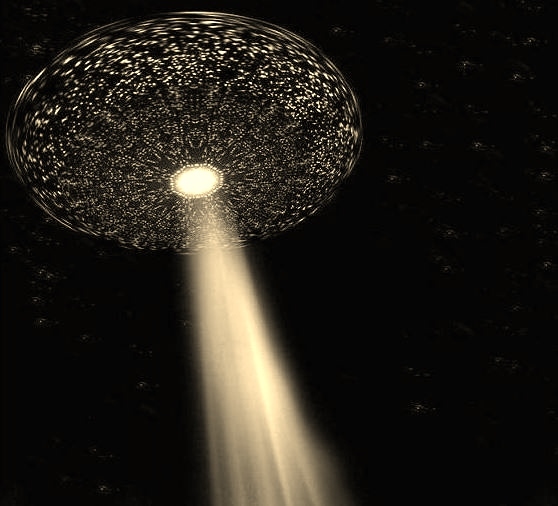 My wife and her friend were walking home from junior high school in Fontana, CA around 1985 when a large disc shaped object appeared instantly out of the sky just above them. They didn’t see it approach, it was all of a sudden just there, hovering just above the tops of the buildings. What happened next is unknown. My wife and her friend both remember being at home the very next moment, with no recollection of how they got home. They both questioned each other to confirm that they saw the same thing and they did and neither of them could remember walking home, and several hours had passed. After high school, my wife and her friend ended up going separate ways and did not talk again for maybe 20 years. By then my wife and I had already been together for some time and I had heard her story. Because she remembers so very little other than the ship and then mysteriously waking up at home, she doesn’t have a whole lot to say. She is a very pragmatic person and has never tried to embellish the events and has always kept a very consistent retelling. As I mentioned, my wife and her friend went separate ways after high school. Several years ago, my wife’s friend wanted to corroborate her story again so she went on a search for us and she did locate us. Her and my wife reconnected and retold their stories to each other and my wife’s friend story was identical to my wife’s. During their conversation, they both brought up the fact that they think they were given implants. Neither my wife or her friend had ever had surgery in the areas they feel their implants are located. It can easily be felt just below the surface of the skin. I am contacting you because after looking up similar experiences online, we would like some answers, and possibly have the implants reviewed by a professional to confirm if they are really implants. Thank You. NOTE: The above image is cgi.